Newly-discovered planet KELT-4Ab has three suns—but that triple-solar view isn’t the only weird thing you’d see happen overhead. Not by a long shot. The details of the discovery of this triple sun planet were published in the Astronomical Journal. We talked to the lead author of the paper Jason Eastman of the Harvard-Smithsonian Center for Astrophysics to find out a little more about how those three suns would move in the sky. You’d see the primary star about the size of your outstretched, splayed hand (about 40x the apparent size of our Sun). Your year and day would be the same: 3 Earth days, which means half of planet would be in continuous daylight and the other half would be in continuous darkness. You’d also see two points of light about 2 degrees apart, each as bright as the full moon (KELT-4BC). Those two points would orbit each other every 30 Earth years, and every 4000 years, they’d make a complete orbit in the sky (that is, for 2000 years, they’d rise during the Summer and for 2000 years, they’d rise during the Winter). Although unusual, though, KELT-4Ab is not the only triple-sunned planet to be discovered. Other triple star systems, like HD 1885 Ab pictured above, also have similar skies. So what makes this one so worth keeping an eye on? 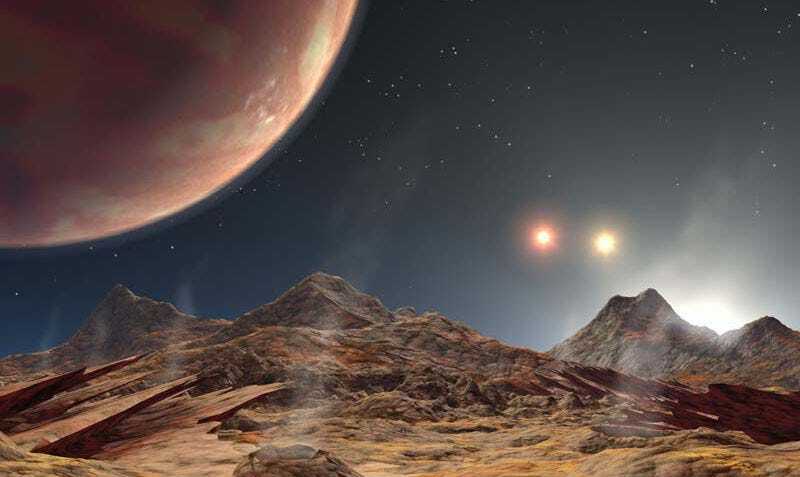 The other systems that have been discovered have been much further away, this one, however, is just 210 parsecs away—and that gives us an opportunity to learn more about how triple-sun systems form in the first place.